“My son Jacob showed me his book Under the Sea, we went to an aquarium and also got a book on the Great Barrier Reef,” explains Elaine Hamey, whose business is based in Urmston, Manchester. The winning cake took over 90 hours of work and is so detailed that it seems to capture the motion of the sea. Advanced cake making and baking skills were used in the creation of the winning cake with very delicate confectionery techniques being implemented to capture the minute intricacies of the detail, even showing every individual sucker on the octopus. 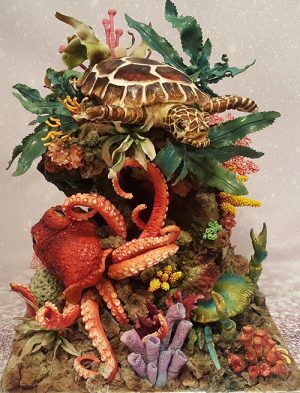 The cake shows obviously an Octopus and a turtle but its only when you get close and inspect it that the attention to detail is really brought to life. The rocks are very realistic looking and are created using a technique where the icing quadruples in size and can be broken up to give the jagged resemblance of rocks. A nearby crab rearing up on its hind legs is also missed and the various plants and seaweed really give this cake a lifelike appeal. Elaine worked on this cake alone from 9pm until midnight each evening due to her busy schedule with her popular shop based in Manchester. Elaines Creative Cakes is based in DaveyHulme and Elaine herself is no stranger to awards after being a regular winner and runner up in baking contests for years. 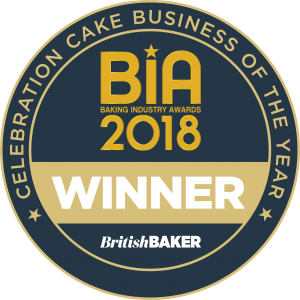 If you are looking for inspiration and something new for a celebration then who better to go to than an award winning cake maker, the best confectioner for celebration cakes in 2018 – Elaines Creative Cakes.